Mother Daughter Book Club! More information about this will be posted here on the blog later this month. I do hope you will check it out! And Happy Mother's Day fellow moms! YAY Sweet Evil and City of Lost Souls. We must chat once you are done! I am looking forward to it. I can't wait to read your review for Darkness Before Dawn. I think it sounds pretty good. Great haul this week. Very curious about this mother/daughter bookclub thing. Sounds fun. Ahh! I can't wait to read Sweet Evil and The Unquiet! They look/sound sooo good :-) Very nice book haul! Hope you enjoy all of them. Happy Mother's Day! Fantastic book haul, Christy! 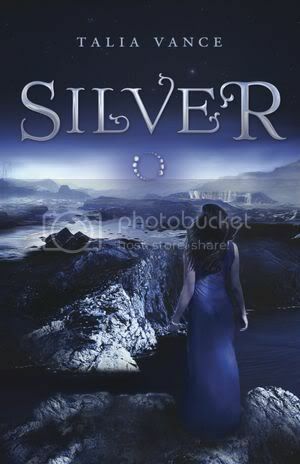 I particularly want to read Silver and Darkness Before Dawn :) Enjoy your yummy books! I really need to catch up on the Shade trilogy, so I can read Shine. 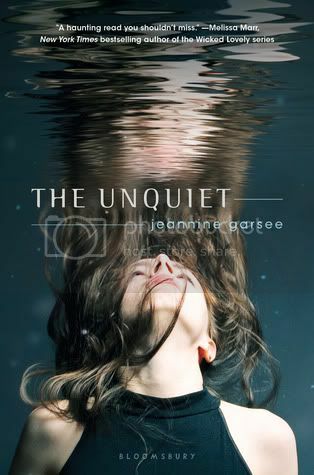 The Unquiet looks interesting. Awesome book haul! I do really want to read City of lost Souls and Sweet Evil. Happy Mom's Day! I can't wait until you do review all of them. Oh my WOW, that's an awesome haul! CoLS and Sweet Evil and Darkness Before Dawn! And you got The Unquiet approved, I really want that one too! Enjoy all your new beauties! I looooooved Sweet Evil ... Gosh I'm obsessed with this book! and Darkness Before Dawn? Can't wait to read it myself! I'm excited about Darkness Before Dawn as well! All the Scholastic books look great too. Enjoy everything and have a happy Mother's Day! OOoh a little envious that you got Darkness Before Dawn! Of course I have more than enough to read til its release! Happy Reading! I enjoyed Sweet Evil and hope you do too! Release date of Darkness Before Dawn is slowly nearing - what a gorgeous cover.. Can't wait to read it! I hope COLS blows be away because COFA was a tad bit disappointing. Fingers crossed! Your NG books are GORGEOUS. *grabby hands* So tempted to grab them but my TBR pile vs Time graph is..not good LOL. Hope you enjoy all of these. Amazing! Wow! Lots of great books you got! I haven't read the He Said, She Said series, but otherwise all the books you bought this week have been on my wishlist for a LONG time! Also, The Unquiet was on my WOW! Oh, and the False Prince is AMAZING! WOW! Great haul this week... I love the Scholastic book bag as I am a little weird that way! Enjoy the reading! Awesome haul! 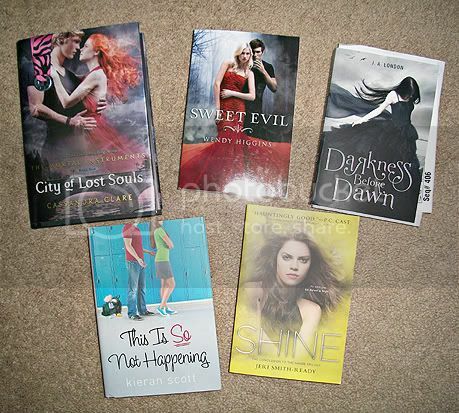 So looking forward to Shine (my next read), COLS, and Sweet Evil will be one of my next purchases. As I mentioned on Twitter, you got some great Mother's Day Haul, Christy. ;) I'd say you deserve it today of all days. I'm sure the Mother Daughter Book Club is going to be such fun, especially judging by the titles in the Scholastic bag. You enjoy all of your wonderful books, and Happy Mother's Day! Epic mailbox this week! I got Darkness Before Dawn too (it was such a surprise) and you got Sweet Evil. 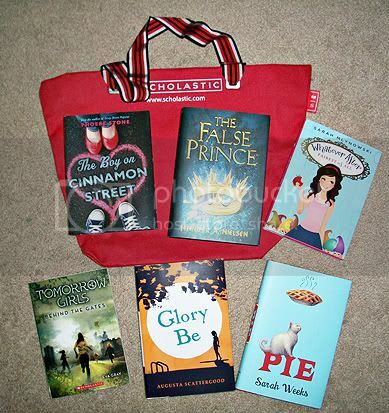 Love the Scholastic bag and books! Here is my book haul for this week! Shine! I'm so curious about how that one will end...and Sweet Evil looks great! I'm dying to read Sweet Evil and I'm waiting to read City of Lost Souls, even though I have it, until I actually read Clockwork Prince. And I totally love your book club bag! Wow, you got some awesome books this week! Enjoy them all! Oh A lot of amazing books! I really want to try the cassandra clare series, I hope it will be soon. happy reading! You got some awesome books, Christy! And you totally deserve to spoil yourself some. :) Happy reading - I really hope you enjoy everything! I'm especially excited for you over Darkness Before Dawn! Super awesome haul this week! I totally want to read Darkness Before Dawn. It looks really good! I love them all! Can't wait to read City of Lost Souls! Stop by and check my book haul? I just finished The Unquiet and it is CREEPY. I'm going to have trouble sleeping at night. Wow you got some great books! Lucky! I'm really looking forward to Sweet Evil but I don't have a copy of it yet :( And congrats on the epic loot from Big Honcho Media and Scholastic! That's super awesome! That's a lot of awesome books! I am dying to read Sweet Evil sometime soon, my library will be hearing from me if they don't hurry and get it in haha. That's also a fun pack of MG/YA for a mother daughter book club, they'll be awesome to read together. Wow, what a GREAT book haul! I am insanely jealous of Darkness Before Dawn, and hope you really enjoy it :-) I really need to start on the Cassie Clare series already so I can fangirl with the rest of you. Haha! What a GREAT book haul! I am especially jealous of Darkness Before Dawn, and really hope you enjoy it :-) I just need to start reading the Cassie Clare series already, so I can fangirl with the rest of you. Haha! Amazing haul Christy :) !! Ok, though I'm a lifelong swimmer, I have this seriously intense fear of drowning so that cover is freaking me out! The books themselves look good, though! That's a great haul. I really like the ones from Scholastic. The NG books are great too. Nice haul. I'd really like to The Unquiet. It looks spooky!